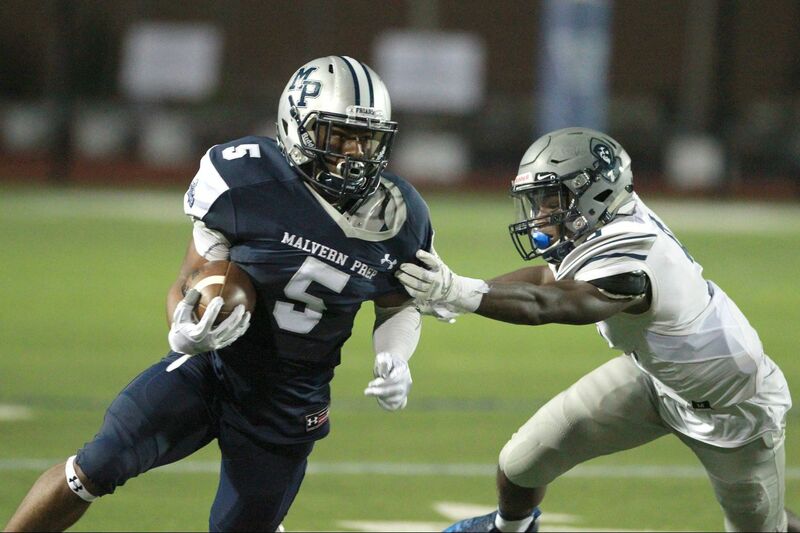 Malvern Prep Quincy Watson (5) breaks away from the grasp of St. Augustine Prep's Jaylen DeCoteau in last season's opener. Coach: Dave Gueriera (second year). Quarterbacks to watch this season in Southeastern Pa.
Last year: 6-4 overall; 5-0 Inter-Ac League. Malvern Prep’s TyGee Leach (7) wraps up Penn Charter running back Brendan Thomas (left) in last season’s Inter-Ac League tilt. The host Friars won, 23-9. Players to watch: Keith Maguire, LB-WR, 6-2, 215; Drew Gunther, QB, 6-3, 205; Jake Hornibrook, OL-DL, 6-4, 275; Quincy Watson, RB-DB-KR; 5-9, 190; TyGee Leach, WR-DB, 5-10, 185; Nick Gueriera, RB-ILB, 5-9, 190; Will Redden, OL-DL, 6-6, 295; Brendan Flynn, OL-DL, 6-2, 255; Buck Walsh, OL-DL, 6-1, 265; Harry Stinger, OL-DE, 5-10, 215; Lonnie White, WR-DB-KR, 6-3, 205; Mike Gussey, LB, 6-1, 200; John Turley, DL, 5-10, 220; Domir Brown, DL, 5-10; 215; J.T. Roberts, DL, 6-1, 250; Kevin White, DL, 6-0, 200; Ryan Iacone, WR-DB, 5-10, 185; D'Angelo Stocker, CB-KR, 5-10, 165. Quick facts: Maguire (Clemson), Hornibrook (Stanford), Watson (Delaware), and Leach (Lehigh) have made college commitments; Gunther, a starter since midway through his sophomore season, has offers from Brown, Fordham, and Georgetown. … Will Redden, a junior transfer from Kennett High, is expected to be a force on the offensive line. … Nick Gueriera, a senior and the head coach's nephew, was a second-team all-Inter-Ac selection last season. The Friars will open the season against Roman Catholic on Aug. 24 at 7 p.m. at Wildwood's Maxwell Field. Their other nonleague foes are La Salle, McDonough (Md. ), District 3's Berks Catholic, and Peddie School (N.J.).